Not only is the Post Office in Redwing, Colorado a trailer, it even has a basketball hoop in the driveway so the employees can shoot some hoops during their lunch hour. As you can see, this guy from Iowa has acquired many things over the years. Notice the guard dog standing next to the truck, protecting all of his valuable possessions. 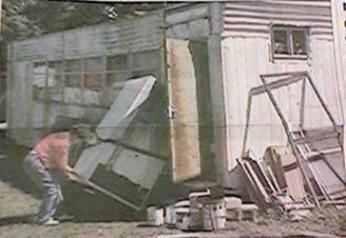 The owner of this Florida trailer was cited by the city because the trailer's area was not being kept, but I'm sure the inside looks nice! 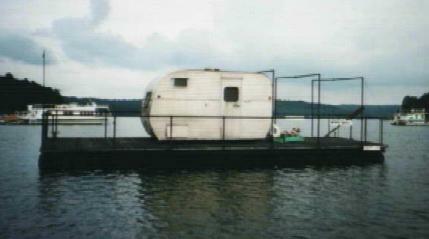 Why spend thousands of dollars on a yacht when you can make your own for just a few hundred, like this guy in Indiana. This trailer in eastern Kentucky was obviously inspired by Wrigley's Fruit Stripe gum. Why spend thousands of dollars on a log home when you can paint the exterior of any trailer to give it the appearance of being a log home, just like this one in Jackson Hole, Wyoming.